I am rather excited that the Winter Olympics open in Vancouver this evening! The Opening Ceremony is a three-hour extravaganza which will be aired on BBC Two at 01:45 GMT Saturday Morning. 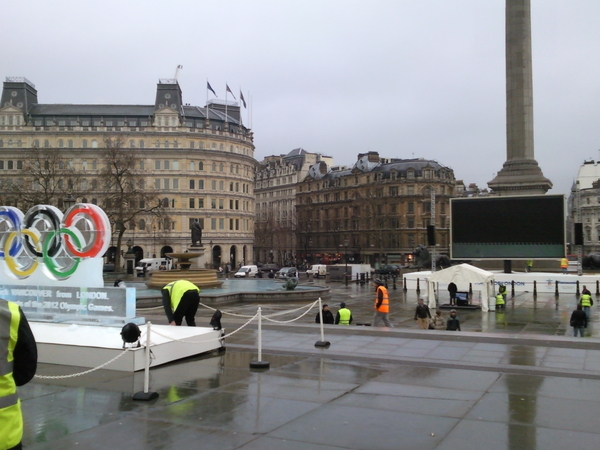 It looks like Trafalgar Square is slowly getting into the spirit of the day, and I look forward to seeing what they’ve done with it on my way home! 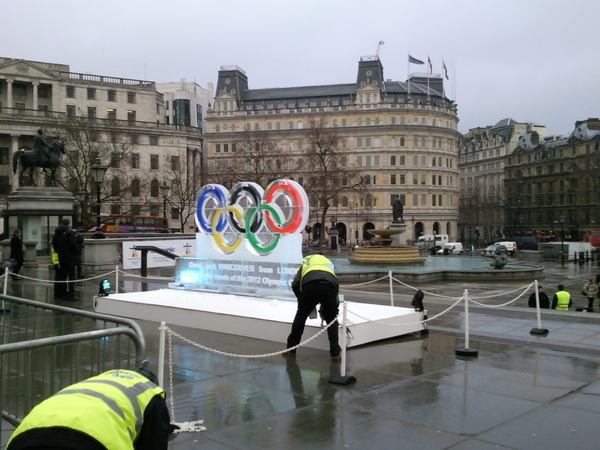 Currently it’s as below, with a rather fab ice sculpture of the Olympic Rings (‘engraved’ with a good luck message from London). NB – the workmen aren’t being nasty to the people of Vancouver by displaying their rumps… the area in front of the sculpture is a designated press area, so I had to snap and run heh.